Aside from First Star and NHLPA Playoff Performer of the Night Pekka Rinne, who else came up big for Nashville? Check out what these five players did to help deliver a decisive 4-1 win on Monday night. Nashville’s captain netted an assist, dished out two hits, had one takeaway, notched an assist and was 13-10 in the face-off circle, en route to second star of the game honours. It was a history-making night for the 24-year-old forward, who joined the Chicago Blackhawks John Harms (1943-44) as the only players in NHL history to record their first three career goals in the Stanley Cup Final. Not bad for a guy whose stall is in the middle of the Predators dressing room. The centreman chipped in offensively with his ninth goal of the post-season – the final goal of the game – and dished out five hits on a night where he took 27 shifts in 18:34 of ice time. 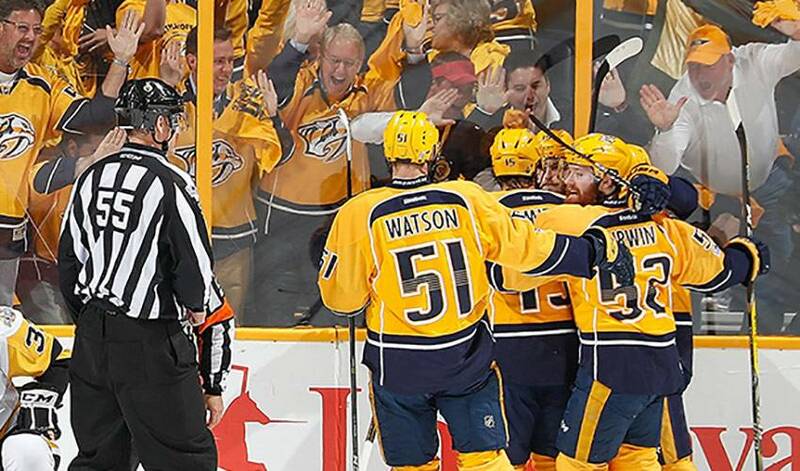 The feisty forward was once again at his Smashville best, delivering a game-high six hits. Add in an assist, a blocked shot, a plus-1 rating, and winning his only face-off of the contest, and it was another big-time effort from the energetic left-winger. The centreman tallied Nashville’s first goal of the game at 14:51 of the first period. He had three shots on goal, registered one hit, saw time on both the power-play and penalty kill, and was a plus-1 for the Predators.